Four years ago (3/11/2011) Southwestern appeared — as it often has — among our stocks to study during our weekly update. The stock price at the time was 36.12. And although the price reached 49.2 during 2014, the persistent backslide over the last year to 24.54 means that SWN has delivered an annualized return of -9.2%. The Wilshire 5000 has gained 14.8% during the Southwestern swoon. 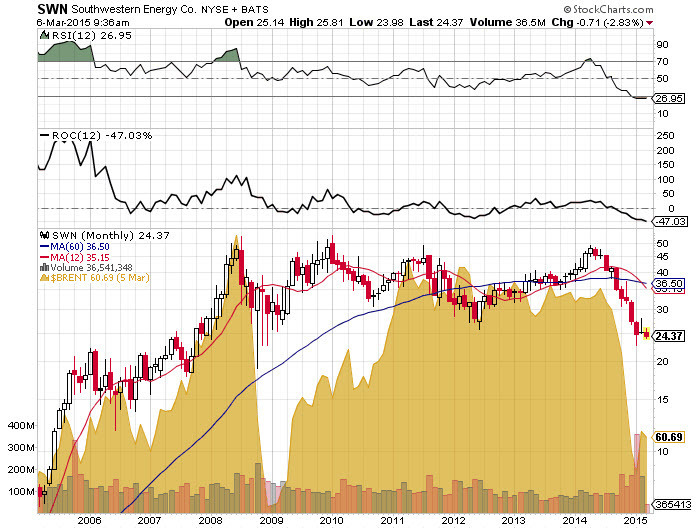 Southwestern Energy is primarily engaged in the exploration & production (E&P) of natural gas and oil. Our forecast at the time featured 10% sales growth, 26% net margins and a projected average P/E ratio of 19x for a projected annual return of approximately 9%. What’s gone wrong? Overall, the sales growth forecast has remained intact. It seems reasonable to expect 7-10% from this relatively small and well-managed company. The profitability is what has waned. Value Line’s 3-5 year forecast was 31% four years ago and we took some “shots” at that optimism at the time with some duct tape. Optimism is a good thing — in moderation. The P/E of 20x or so is still OK. This is a good company. Yes, Virginia, stock prices follow earnings. . If it’s reasonable to expect the conditions shown in the accompanying analysis, the Southwestern stock price is going to ultimately follow the blue arrow. But it might gurgle for a while. Why? Because the economic environment and the prices on gas pumps matter. When they tumble, like from $4.29 to $2.19 rather rapidly, companies like SWN get hammered — some more than others. Check out this side-by-side of the SWN stock price swoon versus the price of oil ($BRENT) as a proxy for “energy prices in general.” Believe it or not, Southwestern is less impacted than most and generally recovers faster than most. 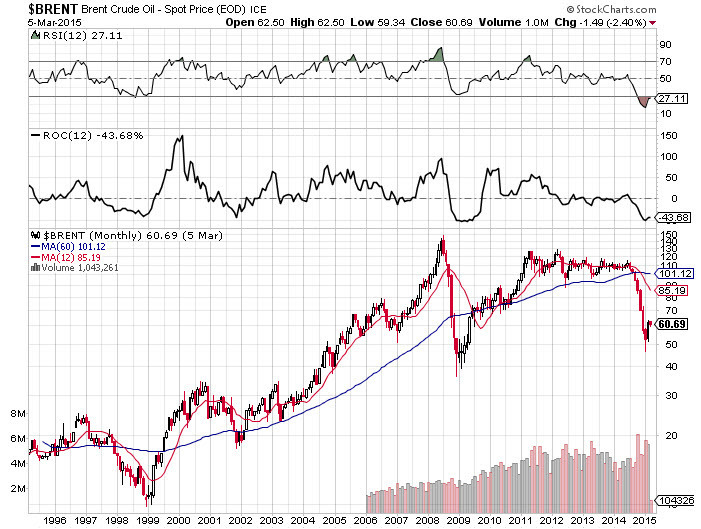 The natural gas and oil portfolio diversification of their operations probably helps here. Q: Does the price of energy fluctuate? Many of us, including Hugh, have been talking about the accumulation opportunity that we’re currently experiencing with companies like BP (BP), Schlumberger (SLB) and others. Looking at the preceding graph, unless you expect that long-term moving average (blue line) to invert and start heading “south”, energy prices will be higher at some point in the future. Companies like Southwestern will persist and ultimately do better. Personally, I look at the long-term characteristic of that trend (+6.3% annualized over the last 6 years) and see $130-$150 price levels in 3-5 years. It’s possible. Virginia would like to remind all of us that stock prices follow earnings … eventually.